Brita had been very excited lately. It seems like there are so many birds in our garden all of a sudden. Most of them stay up very high. Some of them - the brave ones - perch on the lowly shrubs. When that happens - Brita's keen sense alerts her and she starts barking at them. 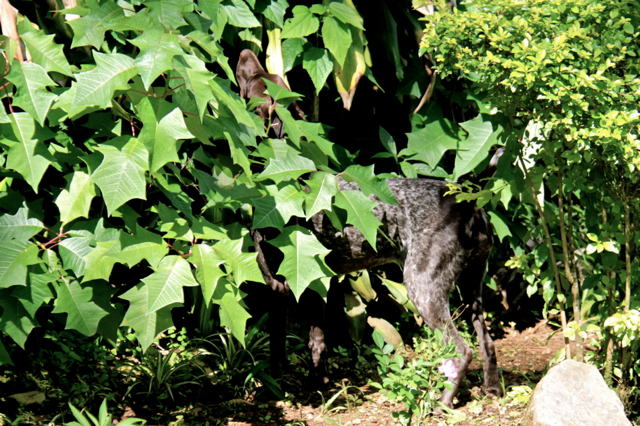 In the afternoon - when it's not raining - we let all three dogs out into the garden. Brita - being the great bird dog that the is - searches for her "prey". So far she has not caught any bird - but she's very alert. Look at her in this pic. I think she spotted one of the big crows's nest.